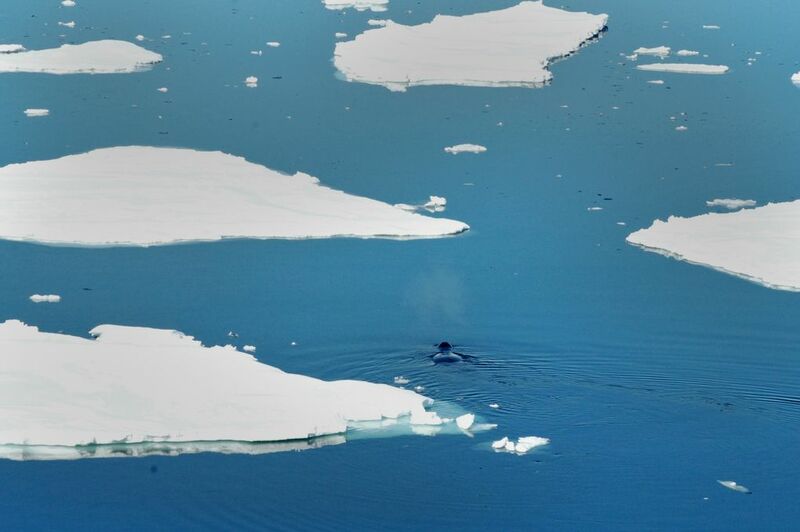 UW scientist records the “jazz singers of the Arctic” as bowhead whales shriek, moan, rattle and ululate under the ice during the dark of winter. 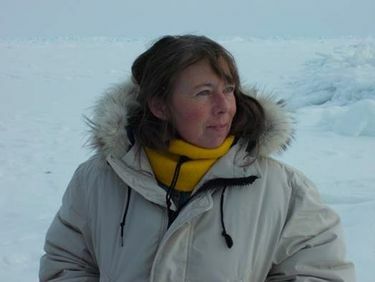 Kate Stafford has listened to more bowhead-whale songs than any person on the planet — but when asked to describe the sound, she’s momentarily at a loss. Stafford and her colleagues have been eavesdropping on the massive, mysterious beasts for a decade. Among their early discoveries was that the whales sing nearly nonstop throughout the dark Arctic winter, hidden beneath thick sea ice. Now, the researchers have published the largest set of bowhead recordings ever compiled, documenting an astonishing repertoire of vocalizations that may be among the most diverse in the animal kingdom. In addition to providing a glimpse into the social lives of one of the longest-lived creatures on Earth, the recordings also offer a way to monitor a species that was pushed to the brink of extinction — but that appears to be rebounding in some areas. “This crazy, crazy singing behavior really emphasizes how special the Arctic is, and how much is going on all the time in this place that people think of as dark and desolate,” said Stafford, lead author of the report published April 4 in the journal Biology Letters. No one knows for sure what all the crooning is about or why bowhead songs are so different from any other mammal’s. The only whale that comes close in terms of complexity is the humpback, but humpback songs are made up of distinct phrases strung together in an orderly fashion. Bowheads are the only baleen whales that live exclusively in the Arctic, so few people will ever see one. 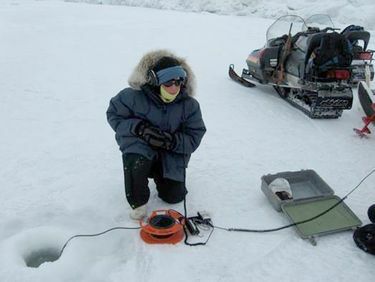 The latest recordings were captured by a hydrophone, or underwater microphone, attached to oceanographic instruments tethered off the east coast of Greenland in water more than a half-mile deep. To conserve batteries in the frigid environment, the recorder switches on for about 15 minutes every hour. Researchers must visit the site by ship to retrieve the data every season. In recordings between 2010 and 2014, Stafford and Norwegian scientists Christian Lydersen and Kit Kovacs identified 184 distinct songs. A new set of songs debuted each season, and no song type was ever repeated between years. The data also confirmed that the whales sing almost continuously from November to early April, when the Arctic is locked in ice and darkness. That’s the breeding season, so the assumption is that males are belting out tunes to impress females with their virtuosity and make their presence known to rivals. But because it’s virtually impossible to observe or track the animals during the harsh winter, it’s impossible to be certain, Stafford said. Also unknown is whether each whale sings a single, unique ballad, or performs from a portfolio of multiple tunes and variations. To the human ear, the songs are not melodic. Some interludes have the eerie, sci-fi quality of a theremin. Seconds later, the whale may jabber like a monkey, screech like fingernails on a blackboard, or creak like a rusty gate. For anyone who studies marine mammals, it’s no surprise that bowheads have the weirdest songs, said Sue Moore, a biological oceanographer at the National Oceanic and Atmospheric Administration’s Pacific Marine Environmental Laboratory in Seattle. “Bowheads are just phenomenal in so many ways,” said Moore, who has worked with Stafford but was not involved in the new study. One of the largest whales in terms of bulk, bowheads get their name from a heavy, domed skull that allows them to push up through a foot or more of sea ice to breathe. They also have the biggest mouth of any animal. Bowheads are among the longest-lived animals on Earth. Analysis of earwax plugs and changes in eye structure, along with the discovery of historic stone and metal harpoon tips in leviathans harvested by indigenous peoples, all point to a life span of up to 200 years. That means some of whales alive today could have been born when Abraham Lincoln was a boy. 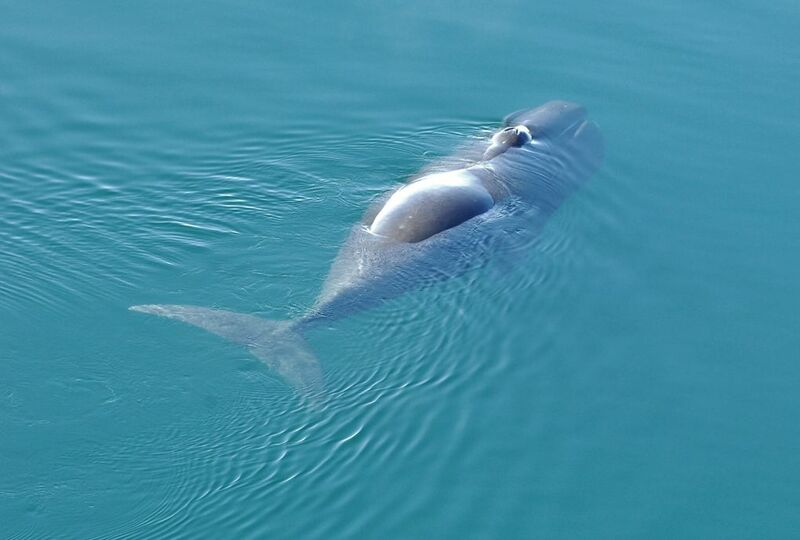 Researchers recently sequenced the bowhead genome, in hopes of eventually unlocking its longevity secrets. The very features that allow bowheads to survive in the Arctic, including the thickest blubber of any whale, made the species a prime target of commercial hunting by Basque and Dutch whalers off Greenland starting in the mid-1600s. They were also prized for their long plates of baleen, which acts as a strainer to scoop up small fish and crustaceans, and was used for buggy whips and women’s corsets. A worldwide population that probably exceeded 50,000 was reduced to an estimated 3,000 animals by the early 1920s. 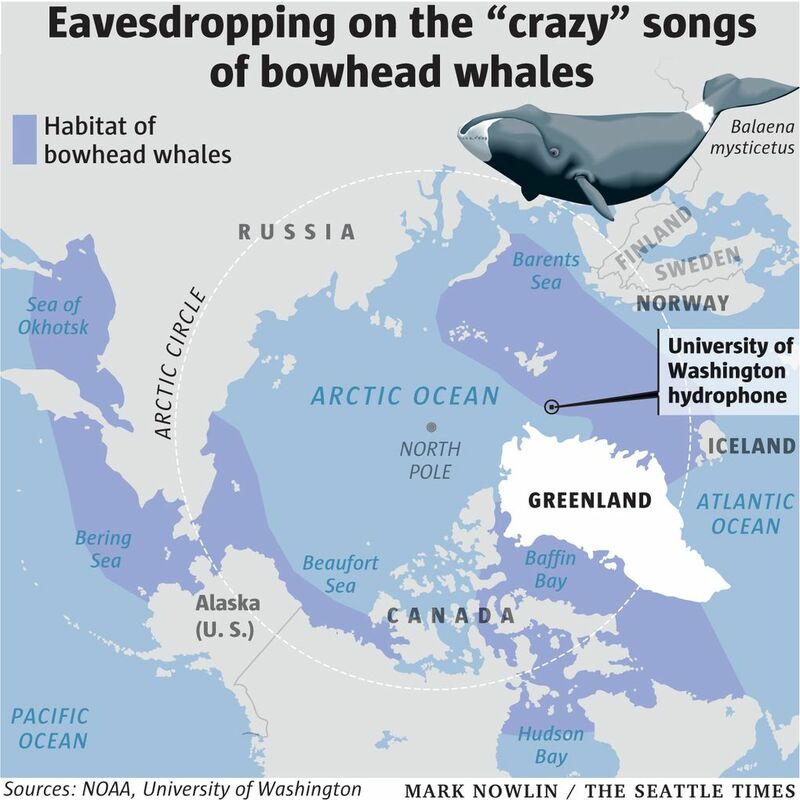 The bowhead population off the West Coast of North America seems to be recovering well, said Stafford, who uses audio recordings to help count the whales every year as they migrate between Alaska’s Bering Sea and the Beaufort and Chukchi seas. 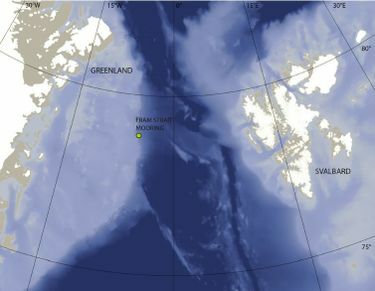 But the population east of Greenland was thought to be reduced to a few tens of animals, until some of Stafford’s earliest recordings hinted that there might more than anyone realized. Since then, a summertime, aerial census counted nearly 350 bowheads between Greenland and Svalbard, Norway. Bowheads may be among the lucky species to thrive in a rapidly-changing Arctic, where thinner, less extensive ice allows plankton to bloom earlier and in greater abundance, said Moore. That nurtures the tiny crustaceans baleen-feeders like bowheads feast on. “It seems as if productivity, at least in some regions, is increasing,” she said. Stafford and her colleagues hope to expand their acoustic monitoring, to triangulate the songs and get a better handle on the numbers of animals. And they dream of someday being able to attach an acoustic tag to a bowhead, to record its songs and travels at the same time.